It is with great joy and thanks to the Holy One Blessed be He, that Ellen Miller Braun and family shares this creation with you. 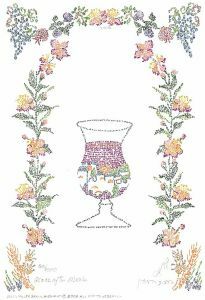 This magnificently flowing design was created for the wedding of Ellen\'s daughter. Ellen Miller Braun has carefully crafted this inspiring picture to express and emphasize the Biblical commandment for nations to Bless the \'Apple of His Eye\'-the Jewish People. She has drawn the \'Sabra\'-a cactus plant that is found everywhere in Israel. The Hebrew word \'Sabra\' refers to a native born Israeli. The plant is very coarse and prickly on the outside but once piercing the exterior skin, one finds a tasty and sweet fruit on the inside. This is symbolic of the difficult struggle and tragic history that represents the last two thousand years of Jewish history. It speaks of the miracle of the survival of the Jewish people throughout several millennium of dispersion to virtually every country and corner of the earth. But, like the \'Sabra\'?once the hard and prickly surface is pierced?what comes next is the sweetness of the return of the Jewish people to Israel and world redemption. May your love of Israel bear beautiful fruits for you and your loved ones. Ellen Miller Braun was born and educated in Chicago Illinois, U.S.A. She studied fine arts at Northeastern Illinois University. An ardent Zionist, Ellen immigrated to Israel with her husband and children in 1983. They live in Ginot Shomron, in the Biblical hills of Samaria. Ellen\'s traditionally observant Jewish background has guided and inspired her in the development of the Biblical themes of her artwork.